That just about concludes our coverage of today's One-Day Cup final at Lord's. Well done Nottinghamshire, commiserations Surrey. Thanks for joining Paul Grunill and I, we'll see you soon! Surrey got technically outplayed. When Chris Read bought Samit Patel on, it changed the pace and the momentum of the game. Alex Hales is man of the match but if there was a runner-up then it's Read for his tactics and the way he marshaled his troops. What an extraordinary day for all involved at Notttinghamshire County Cricket Club. Alex Hales played just a beautiful knock when his side really needed it under pressure. His technique was flawless throughout - great balance, poised at the crease. It was one of the all-time great innings. It was an excellent knock from Chris Read, the Nottinghamshire captain. Yes, he didn't want to get out, yes, he wanted see it to the end and walk his team off the field - but he got out on his terms. He marshaled his troops brilliantly. It's the icing on the cake of a long career. It's been a great start to my last season. I've always said, any day you win a trophy is a great day, one that should be remembered for a long time and should be cherished. What we've witnessed today from Alex Hales was something very, very special. It was an absolute pleasure to be up the opposite end from him. Surrey have been outdone by a fantastic knock from a fantastic player today. And here's that moment they got across the winning line. Having plodded up to the podium and collected his medal, Chris Read, surrounded by the team-mates who he'll be leaving at the end of the year, holds aloft the One-Day Cup to a hearty cheer at Lord's. A fantastic moment for both he and Nottinghamshire. It's a brilliant win. What an innings from Alex Hales - and fantastic for Chris Read to be there in the partnership to win the game. It's brilliant for the club, it's been a team job all the way through the competition. It's a pretty bitter pill to swallow, but Nottinghamshire were magnificent today. I'm really chuffed for Chris Read, 20 years in the game and to finish like that is magnificent for him. Alex Hales was the man who took it away from us - no complaints. This is hardly one of the great shocks of the cricketing year. Alex Hales is named man of the match for the innings we've all been eulogising over for the past few minutes. If you want to read some more about Alex Hales' heroics, you can do so by following Adam Williams' developing report from Lord's below. 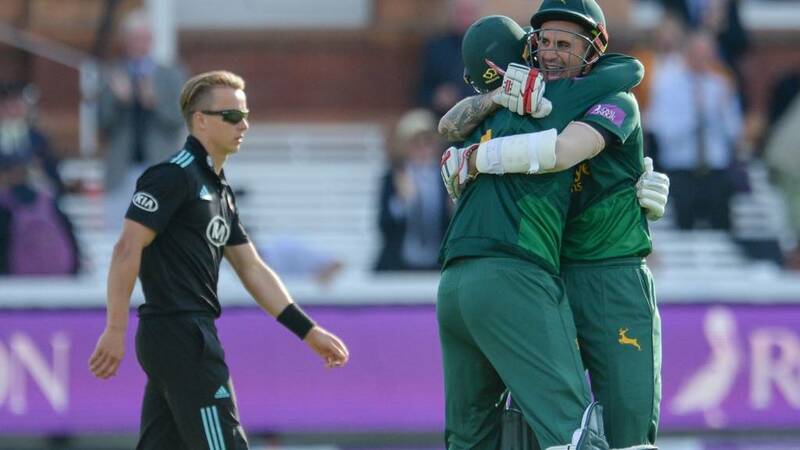 Alex Hales hits 187 not out, the highest score in a Lord's final, as Nottinghamshire beat Surrey to win the One-Day Cup. Toby Armstrong: What an innings from @AlexHales1! Well played sir! Tony Clark: Well done Notts and a great performance from Alex Hales! There's a lot of love for Alex Hales and Chris Read out there right now. Please do continue getting in touch with your thoughts via #bbccricket on Twitter. His 187 passed the previous highest individual total in a county final at Lord's, beating Geoffrey Boycott's 146 for Yorkshire, which was also against Surrey. Hales also bettered the previous best-ever List A score at Lord's - David Boon's 166 for Australia against the MCC in 1989. He also improved on his personal best List A score, the 171 he clobbered for England against Pakistan at Trent Bridge last summer. His score accounted for nearly 63% of Nottinghamshire's runs. Of the 595 runs to be scored, he and Mark Stoneman (144 not out) got 331 - more than half! It's an incredible, special feeling. The way we fought back with the ball after a good start kept them to a below-par score - and then to go out and do that with the bat was special. It's right up there for me personally, particularly in such an important game for the club. Alex Hales, for the record, ends unbeaten on 187. His 167-ball innings included 20 fours and four sixes and will surely go down as one of the great domestic List A innings of all time. Given the context, given the occasion, given the wickets falling around him, it really was that good. After James Pattinson is, at first, foiled by mid-wicket, he pulls the follow-up ball around the corner for the single Notts need, sparking jubilant celebrations on the balcony and a huge roar, jump and fist pump from Alex Hales. Well played, Nottinghamshire. You are the 2017 One-Day Cup winners. After Alex Hales scampers a single, James Pattinson top edges for four. One more precious run for Nottinghamshire needed. A couple of dots to end the over presents Alex Hales with an opportunity to hit the winning runs. Six needed off 18. Sam Curran to continue with ball in hand.